How to build a paper airplane and also learn how to fly a variety of paper airplanes including the fastest jet paper airplane is what you are going to enjoy here. We have got it all covered from every angle right here for you as you are about to see. Every - "how to, what for, when do I, where should I, why and which one" regarding your desire to build a paper airplane. There are a number of paper planes that are here for you to make and build. Some are amazing for stunt flying and others are so fast you will think they are real! So come on, let's get started and have lots and lots of fun! Knowing how to build a paper airplane is easy. However, you want to compete with the rest of the world. Best Paper Airplane making takes a lot of practice. Then comes the practice to fly your airplane. Here you will find the fastest paper airplane as well as the cleverest and one that flies the longest distance of them all. Learn how to build them by clicking on this following link. Here are some easy to make paper airplanes that will have you chasing them around all day. These airplanes can be flown with your friends. Invite them over to your place and make them for racing and see who can make the fastest paper airplane. See, I told you that learning How to Build A Paper Airplane was a lot of fun! There are many a paper airplane design. Some are simple to make while others are much more complex. Here you are going to find five paper airplane designs that range from easy to moderate (we don't want anything too difficult here). Have a go at creating your paper airplane and then see if you can make changes to it and make a whole new design. Hey, what is aerodynamics and what does it have to do with airplanes? Come and see what factors cause an airplane to fly. How can something rise from the earth when gravity is so strong? There is a lot to learn about flying in this page. Come on in. Jet paper airplanes are the fastest paper airplanes you can make. You can even hear how fast this jet paper airplane flies. 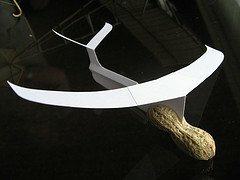 Want to know how to build paper airplane called the Jetscreamer??? OK - here it is. People sometimes think that origami is difficult. However origami just means paper folding and paper airplanes are built by folding paper. Now you know that making paper airplanes or Origami paper airplanes are all very easy to make and have fun with. Come and see why. Making paper airplanes is much, much easier than making your bed or making your bedroom tidy. Come on, why not grab that piece of paper and start folding your paper airplane so that you can fly it around your room. Have fun with it. Paper airplane instructions need to be easy - right? This ensures that when you sit down to build a paper airplane - not long after you are running around chasing it. Last thing you want is a paper ball of rubbish (although it still flies right into the rubbish bin). You now know how to build a paper airplane or more. Now you learn how best to fly them. Do you want a fast launch, or perhaps you want to achieve a stunt from your paper airplane. Whichever style of flight you require and desire can be found right here. Here is a website where you can enjoy airplane flight sims, peruse model airplane cards, create your very own airplane calender and so much more. Enjoyable aircraft resource for all ages.